054: seanwes conference. Think Bigger. About a year ago I took a chance on a conference. This conference was the seanwes Conference, and I was unsure of how things would go. Sean West is an online community for Creative entrepreneurs to build a sustainable business. 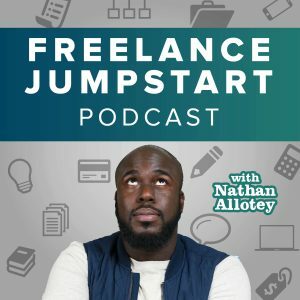 I’m a part of this community, and I have received extreme value out of their online courses, podcast, and Live Events. Another benefit to the community is the fact that they have an online chat system like no other. I made the commitment paid and invested over $1,000 and got ready to go to the conference. My plan was to sleep and wake up at the crack of dawn and get on the road to Austin. Austin only takes about two and a half hours from Houston where I live. As fate would have it, I woke up later than I wanted and I hopped on the road and made it to Austin, but I was late. The good news is I arrived right when the first speaker was giving their talk, but the venue would not let me in. This frustrated me to no end, and I honestly wanted to you know kick down the door end of the conference and just take part in it because I paid for it. 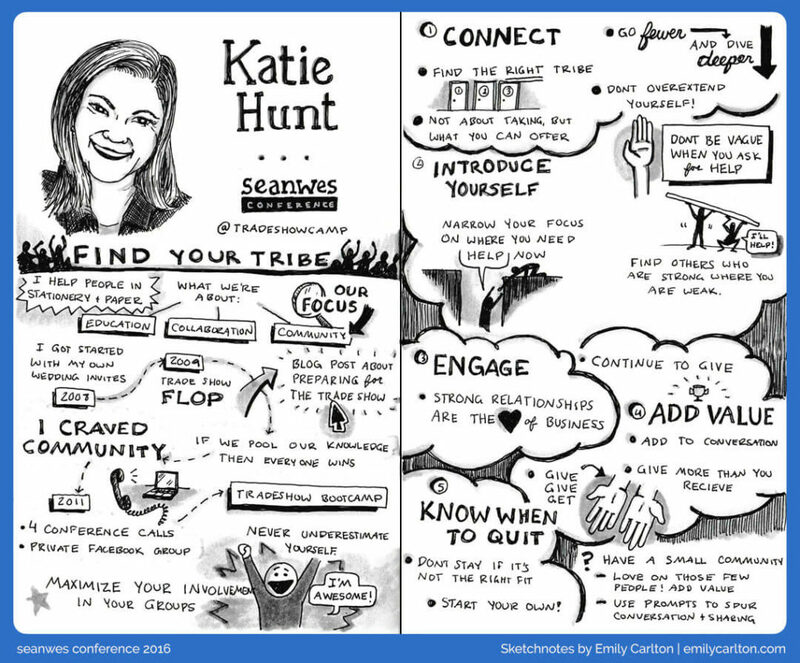 The good news is it’s allowed me to sit down and get some work done and an illustrator named Emily Carlton did a great job with her sketch notes the whole conference, so I still was able to get key takeaways from the first speaker. 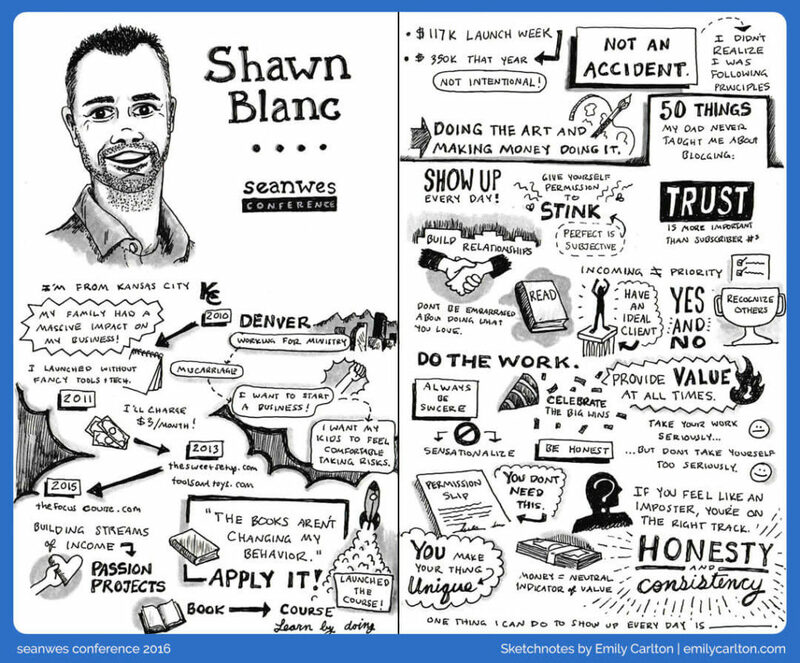 I was already familiar with Shawn Blanc because he created the focus course. That chorus is focused on (no pun intended) Learning to move closer to your goals by blocking out everything that is not specifically related to what you want to accomplish at a given time. Since I was late to the conference I wasn’t able to specifically here his talk, but after talking to different people at the conference I was able to glean a bit from his session. Shawn shared his story about how he got to where he is today. The focus course wasn’t a huge plant success it was a journey of him try new things coming to the realization he wants to build a business writing a book and then translating that to a course. It was a reminder for me to know that not everyone who was successful followed a particular path. Often you find the route of success by doing. If you continue to show up every day, build relationships, Be honest and consistent, Do the work, create value then you’ll be a lot closer to allowing your goals in your passions to come to light as you focus on them one by one. I was already familiar with Katie through her brand Tradeshow Bootcamp. Katie also has hosted a conference for the last nine years and built an in-person and online community. Katie runs the website called tradeshowcamp.com, which was created because Katie went to a tradeshow but didn’t know what to expect or what to bring. It was through that experience Katy realized there needed to be a central place to teach people about preparing for a tradeshow. You cannot be a part of every community. With the success of social media, there’s been a rapid growth of online communities. Katie’s talk was sobering because it was a reminder you only have to be part of communities that are helping you get to where you want to be. From this Katie gave five tips on what to keep in mind when you’re searching for that community. Find the right tribe and be wise about where you spend your time and spend time with only a few communities. Focus on groups that relate to where you are exactly in your business. Before joining the group recognize what you need to look for and don’t be afraid to look outside your industry. Share more than who you are and what you do. Conversations are key to get o know people. Offer to help the admin as needed. Don’t stay if it is not the right fit. Amazing content as usual dude.